Chewy wheat berries develop a juicy "squish" when marinated briefly in dressing. A citrus dressing is a particularly good complement to the tart green apple and vibrant mint tossed into the mix. 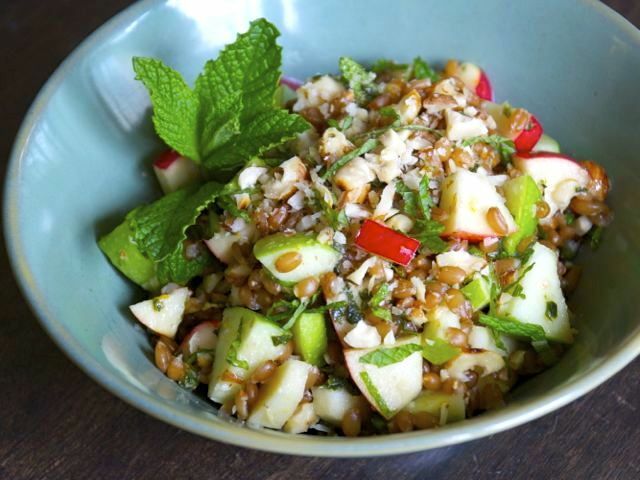 The salad tastes best when freshly made; the wheat berries tend to harden when refrigerated. To improve the texture of any leftovers, loosely cover the bowl of salad with waxed paper, and microwave it for about 20 seconds. Perk up the taste with a little lemon juice. For a variation, stir in 2-3 tablespoons finely chopped crystalized ginger to the blended dressing. You can also exchange short-grain brown rice, triticale, spelt, or Kamut for the wheat berries. Serve the salad on its own or with roast chicken or grilled meat. Blend the orange juice, oil, vinegar, salt, and ½ cup of the mint in a food processor or blender. Meanwhile, core the unpeeled apples and cut them into ¼-inch dice. Stack the remaining mint leaves and roll them into a log. Slice them as thinly as you can. Toss them into the salad along with the apples and hazelnuts. Add more salt, if needed. For the cooked wheat berries: 1 cup wheat berries, 2 1/2 cups water. If time permits, soak the grains in the water overnight. Alternatively, do a quick-soak: Bring the water to a rapid boil in a Dutch oven or heavy saucepan. Stir in the grains. Turn off the heat, cover, and let stand for 1 hour. Bring the wheat berries and water to boil. Cover, reduce the heat, and simmer until tender. Add salt to taste when close to tender. Once a few of the grains have burst open or you detect the whitish starchy endosperm peeking through one end of some of the grains, start checking for doneness: Cut a few grains in half and see if they are one color throughout. If so, taste a few grains and see if they are juicy and the starchy center is soft. Cooking time is typically 30 to 40 minutes for soaked grains, about an hour for uncooked. If the water is absorbed before the grains are done, add more as needed. When the grains are tender, drain them thoroughly. To plump them slightly more and reduce surface moisture, return the grains to the hot empty pot and cover them. Let them steam in the residual heat for 5 to 10 minutes.